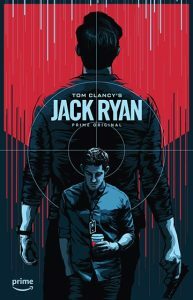 Jaren Hemphill, a Central Arizona College Graphic Design student was recently notified that the poster he designed and submitted for the Amazon Prime Original Series Jack Ryan was selected as the winning entry. Through the art-networking site Talenthouse, Hemphill reviews creative invites and briefs from major US companies for various graphic design contests. The main criteria for the Jack Ryan competition was to portray the main character as an agent and analyst. Jaren succeeded and was awarded $2000 for the rights to his work. Amazon will use the poster to promote the Jack Ryan Series. Hemphill has also sold his artwork at major events such as Comicon. It is Hemphill’s goal to complete an Associate of Applied Science in Graphic Design this spring and transfer to a local university to complete a bachelor’s degree in graphic design, with a focus on marketing the entertainment industry.